The first full day of fall was yesterday and the message from Mother Nature came in loud and clear. Recently, Craig installed some fancy new hatches because he is a stud and studs do super cool handy things like make the boat safer and more watertight. He got so excited about it that he forgot the last step on the aft hatch. So when I came home, there was a large puddle on the bed and a steady drip from the hatch. Not so studly, now! Enter: Krystle. #1 wifey. Master tarp rigger. After a momentary freak out, I got the tarp and fancy bungees we got from Deb and Morris. Bingbangboom! 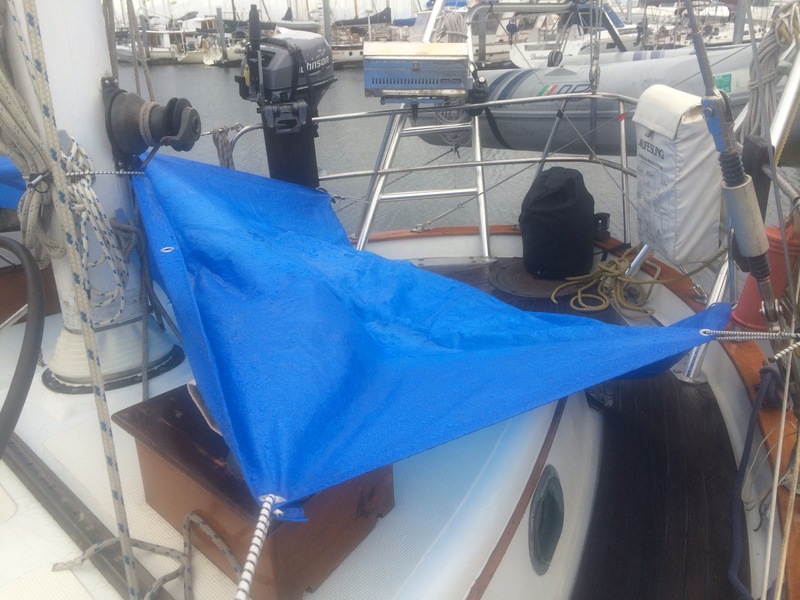 Tarp rigged. Aft cabin dry. Check out that tarp! So much skill. I can tell that you’re impressed. Peekaboo! I see you little leaky hatch! Check out the super cool bungees that can be set to a custom length. Best. Bungees. Ever! 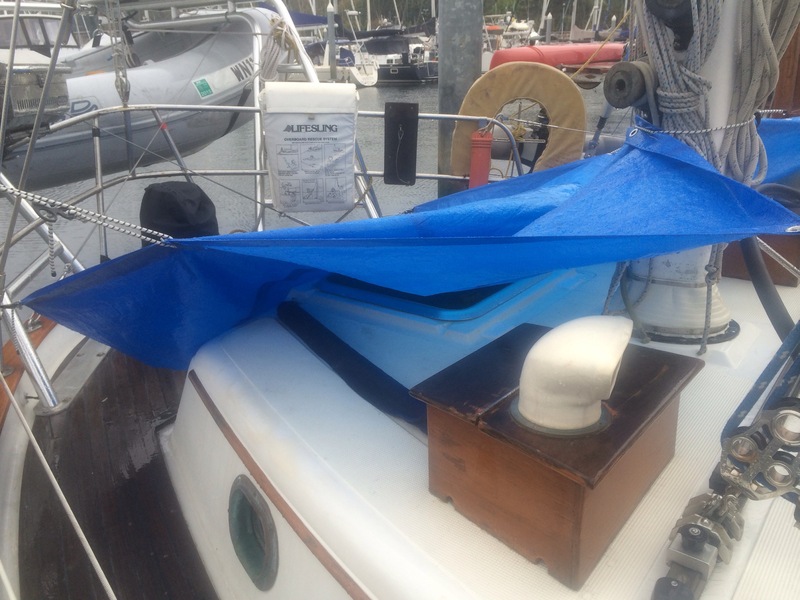 Feeling great about my success with an overly sized piece of blue plastic, I returned to puttering around the boat. 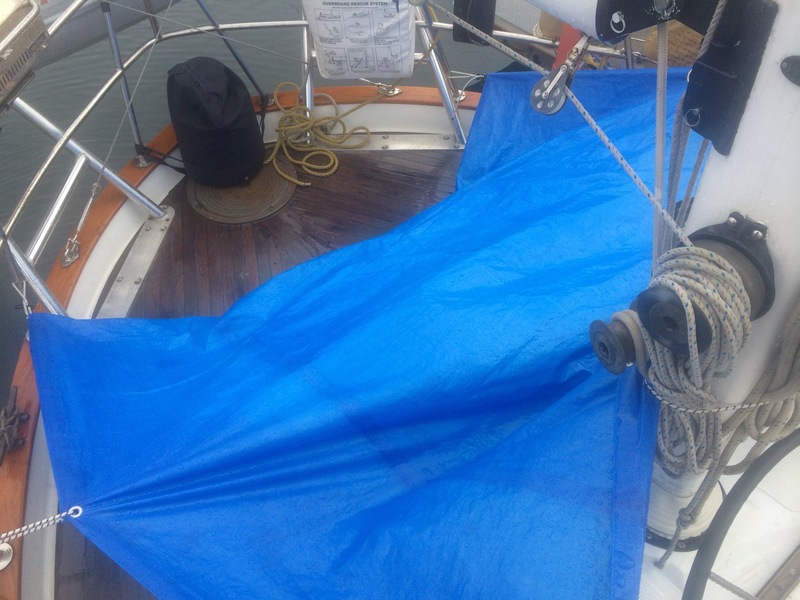 Much to my dismay the leak around the main mast (pronounced mainmst if you’re salty) had returned as well. Craig and I can’t figure out how water is getting in so there is not much to be done other than putting down a towel and a bowl to capture as much as possible. Not two minutes later, I check on the dehumidifier that Craig set up before going to work for the night. It had been a few months since it was out and I wanted to see how well it was working. Spoiler alert: not well. To be fair, it was very effectively taking water out of the air. It was just putting a fair amount of it onto the sole. Everything I tried to do to fix it felt like I was going to break it so I turned it off and and sent Craig a text informing him that I was completely I’ll prepared for wet weather. Mr. Stud was able give me a temporary solution over the phone that got me through the night without any more incidents. I think I would’ve drowned my sorrows in a bottle of wine if anything else had sprung a leak. Has anyone started a countdown ’til next summer? Oh bummer, you guys. Nothing like a wet, soggy bed to tell you the rains have arrived. Hopefully you’ll be laughing about this someday when you are cruising in warm waters, fighting the unrelenting sun. it is long past September now… please excuse my late reading. good to know that mr. and mrs. studly survived the rains of fall! looking forward to your report re: the harshest season — “frozen” comes to small world!